Based in the symfony docs we will try to summarize the implementation of MVC with PHP. In a previous post we explained the MVC design pattern, and now we’re going to see how to implement it in PHP. The above script is easy to write, fast to execute, but hard to maintain; some of the trouble we can find is the absence of errors checking (what happen if the db connection fails? ), the HTML and the PHP code are all mixed and the script is tied to the MySQL database. To determine if the view is clean enough, a good rule is to have the minimum amount of PHP code in a way that the view could be understand it by a designer without PHP knowledge. The most common and proper PHP syntax in the view are echo, if/endif and foreach/endforeach. Also, there should not be PHP code printing HTML tags. Por ende, toda la lógica es movida al controlador, y contiene solo código PHP, sin HTML. Como algo importante, deberías imaginar que el mismo controlador debería poder ser usado para diferentes presentaciones (vistas), tales como paginas HTML, archivos PDF, o en una estructura XML. In this way we have a really readable controller since if unique task is to get the data from the model and pass it to the view. In more complex apps, the controller also handles the request, the user session, the authentication and much more functionalities. 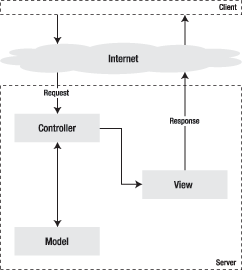 A short description about the Model-View-Controller design pattern. The Model is the business logic, which represents the basic information which the application works. To persist that information, apps can use different storage systems such as databases. Although this is not a concern for this layer. The View renders the Model in the browser to allow the user to interact with it. This layer could be extended to support multiple view sub-layers. The Controller responses to the user’s actions and executes the necessary changes in the Model. The MVC architecture splits the business logic (Model) and the presentation (View), resulting in a very maintainable code. For instance, if an application should run in both desktop web browser and in mobile browser, we just need to work in different presentations (views) while the controller and the model is shared. The model abstract the business logic, which makes the view and controller independent of the business logic and data access. – What is dependency injection? from Fabien Potencier’s blog. – Dependency injection and the art of services and containers by Knp university.